Frank Sidebottom, Shock, Groove Armada, The Department, Fleetwood Mac and more. Show 43 features a classic Bowie track in B-side Babies, several great tracks from new artists, Chi Ming Lai from The Electricity Club revisiting OMD&apos;s Organisation album and the week&apos;s featured Shame track, courtesy of one of our listeners is from Right Said Fred. Plus the usual mix of great tracks! 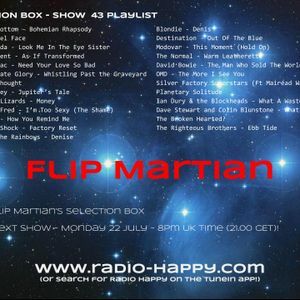 Next show broadcast on www.radio-happy.com on 22 July 2013 at 8pm UK time.